Digestive problems can take many forms and are overall a very common health complaint. However, this usually causes women to ignore them or to brush away their importance, when in reality they act as a major alert sign of overall poor health, unhealthy habits, and hormonal imbalance. While many women who experience frequent bouts of constipation, acid reflux, diarrhea, bloating or cramps are told to simply “get used to them”, there are several ways to diminish and treat these uncomfortable symptoms. In order to learn more about what causes these symptoms, the role of hormones in their development; and how to prevent, manage and treat them; please read the following sections. Irritable bowel syndrome (IBS) occurs up to six times more often in women than in men. Chronic constipation is relatively common in women and tends to worsen with age. Compared to men, women's stomachs empty food slower, which may be an important reason why women experience nausea and bloating more frequently. The term “digestive problems” refers to any distress of any part of the digestive system. 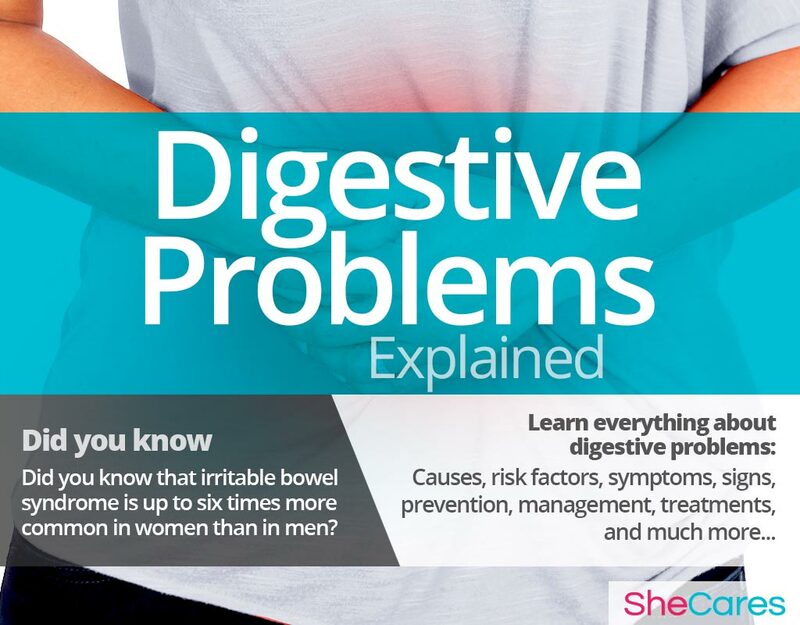 Because the digestive system is very complex and carries a vital function in a woman's body, its problems can appear in very different, and sometimes even contradictory, ways. One of the most important factors in the increased incidence of digestive problems among women is hormonal imbalance. Although many hormonal fluctuations are normal an expected as part of any menstrual cycle, there are certain delicate transitional periods in a woman's life - puberty, pregnancy, the post-partum period, and the arrival of menopause - that cause severe hormonal disruptions, which in turn cause a wide range of digestive symptoms. In addition, many unhealthy habits, especially regarding diet, can trigger or worsen many of these problems. It is difficult to determine all sorts of symptoms that can appear as a result of digestive problems, since the individual experience of them can be drastically different and depends on which particular organ of the digestive system is not functioning properly. However, the most common types of digestive problems are heartburn, constipation, abdominal cramps and diarrhea. In order to understand the processes behind digestive problems, continue on to the next section to read about their hormonal and non-hormonal causes. Learning more about the causes of digestive problems provides the key to understanding how to prevent and treat these troublesome attacks. While the exact causes of these symptoms are complex, most doctors agree that for women, hormonal changes are the primary cause of digestive problems, especially during PMS, pregnancy and right before menopause. In addition to these completely normal hormonal causes, other factors and medical conditions can, in more rare instances, cause digestive problems. Continue reading to learn more about both the hormonal, and other, causes of digestive problems. Hormones are the chemical messengers that control every organ in the body. When fluctuations occur, organs don't receive the correct signals to function adequately, so hormonal disorders occur. In this sense, we can say that digestive problems are caused largely by the hormonal fluctuations during the transitions women go through during their reproductive life. Medical researchers have found that the hormone progesterone is vital in regulating peristalsis, or the synchronized contractions of the intestinal muscles that make food pass along through the digestive tract. On the other hand, fluctuating levels of estrogen can affect the way the body handles stress, causing it to produce excessive levels of cortisol, a hormone that aims to control the body's “fight or flight” response. Cortisol stimulates and inhibits many functions around the body; including appetite, moods, metabolism, and digestion, in order to better prepare it for extreme or life-threatening conditions. Because the production of cortisol depletes the body's stores of progesterone, these two hormones can engage in a vicious cycle where bowels take most of the toll. Hence the reason why more women experience these symptoms during times of significant hormonal imbalance - puberty, PMS, menstruation, pregnancy, postpartum and menopause. 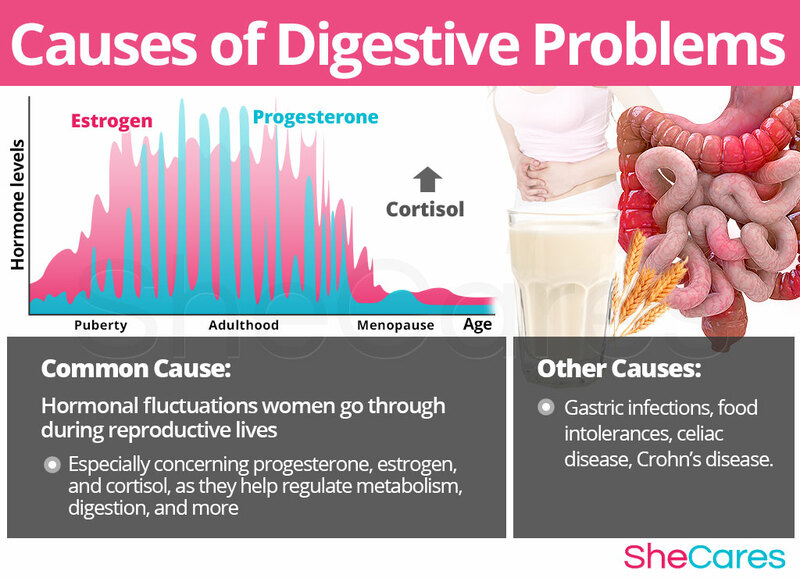 The estrogen deficiency and the extra cortisol during these stages cause digestive problems. PMS is collection of symptoms, typical to the last days before menstrual bleeding begins. It is a consequence of the hormonal fluctuations between estrogen and progesterone linked to the menstrual cycle, and may include constipation and cramping, among others. Puberty is the stage in which a girl's body begins to produce reproductive hormones; these and other factors, such as family and dating pressures, contribute to a teenage girl's experience of digestive symptoms. Pregnancy leads to extreme changes in the production of reproductive hormones, which along with other factors, like morning sickness or bodily changes, can lead to digestive problems. Postpartum and breastfeeding is another stage where reproductive hormones can become imbalanced, leading to different symptoms. While hormonal imbalance is the major underlying cause of digestive problems during a woman's life, it is wise to keep in mind that these disturbances can be caused, less commonly, by other underlying conditions, including gastric infections, food intolerances, or autoimmune conditions like Crohn's disease. 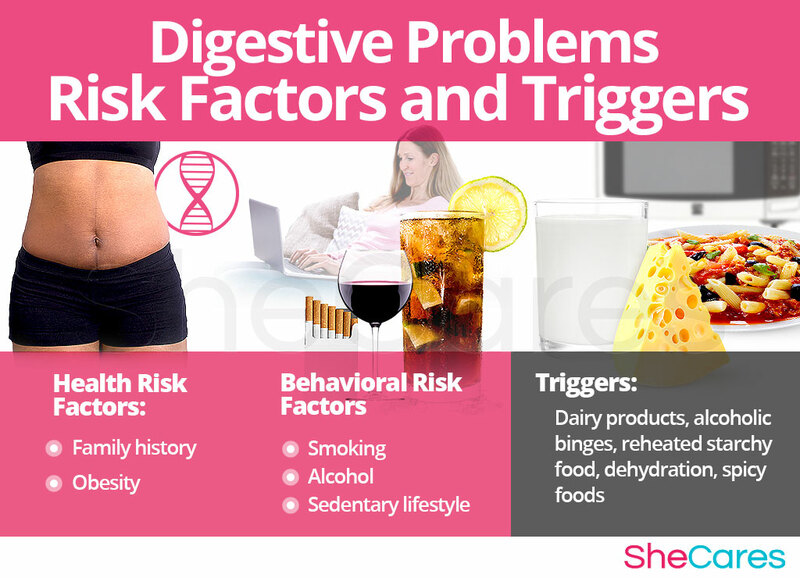 Keep reading to learn more about risk factors and triggers that can worsen a woman's experience of digestive problems. Some women are more likely to experience digestive problems as a symptom of hormonal imbalance. There are several risk factors that can affect a woman's hormone levels and may make her more susceptible to experiencing this symptom. Sometimes, specific foods, substances and activities can directly cause digestive problems. All of these things can be classified as triggers. Identifying and avoiding these habits or substances as much as possible can provide significant relief for women who suffer from frequent digestive symptoms. However, not all triggers work for every woman and some women do not have any triggers at all. Generally, it is recommended that women struggling with digestive problems avoid the substances or situations that trigger them. However, not all triggers will be the same for every woman. Therefore, it can be useful for women to make note of when digestive symptoms occur so they can identify their own individual triggers. A written record will also be helpful if a woman decides to seek medical attention. 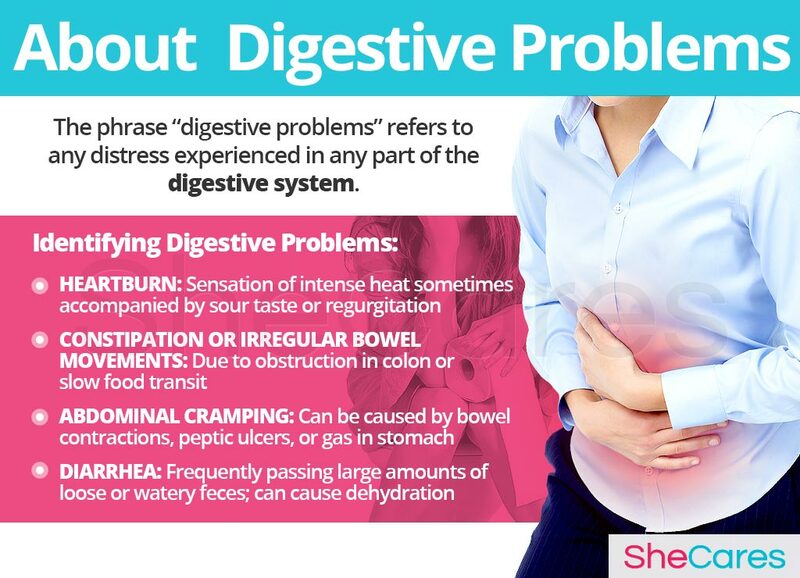 To be able to correctly identify digestive problems, it can be useful to become familiar with all of their symptoms. Keep reading to learn all about the signs and symptoms of digestive problems. 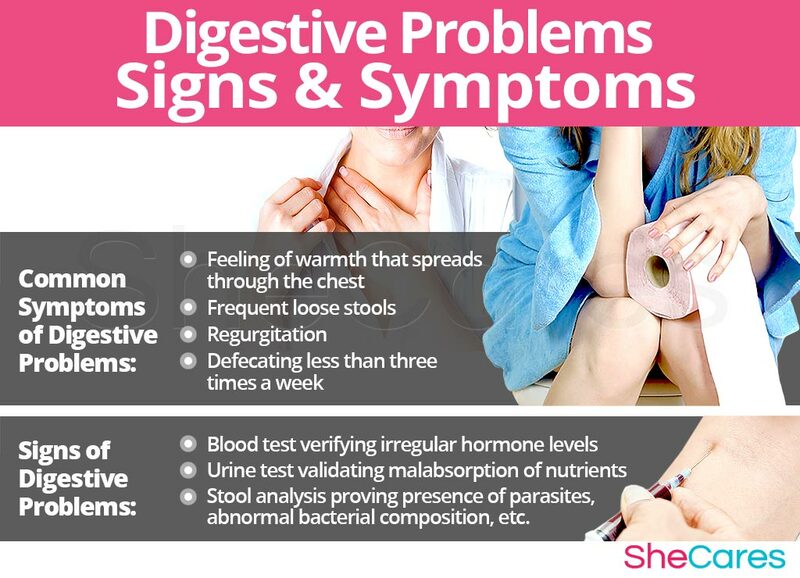 There are different types of digestive problems, and the severity and frequency of each one of them will make every woman to experience digestive problems differently. However, many of their symptoms are common among women undergoing hormonal imbalance. To diagnose and identify these symptoms, the doctor usually must perform two procedures: a review of the patient's medical history and then a physical exam. In some cases, if necessary, the doctor may also order some tests. In rare cases, when digestive problems become chronic and are left untreated, they can lead to certain complications, which are more risky for a woman's emotional and mental health. However, it is important to remember that in the majority of cases, digestive problems will not require any serious medical intervention. These possible, but uncommon, complications of digestive problems can include hemorrhoids, rectal prolapse, and food absorption problems. Women who experience frequent digestive problems that are interfering with their daily lives may wish to treat or learn how to prevent them. Keep reading below to learn useful techniques and habits that will prevent digestive problems or make them more manageable. In general, adding vitamins into your diet is better than taking them in supplement form. The body is better at absorbing vitamins that we eat from foods because that is how it has always absorbed them. However, supplements can be useful in cases when dietary restrictions prevent you from eating certain vitamin-rich foods. Digestion can be affected by a number of different factors, and one surprising factor is hormones, especially the reproductive hormone estrogen. Women are more likely to develop irritable bowel syndrome, likely due to estrogen, and digestion can change during different parts of the menstrual cycle because of the fluctuating hormones. While there is no single way to completely prevent digestive problems, just as there is no way to stave off natural hormonal processes, there are a few steps that a woman can take to reduce her chances of experiencing them, or to minimize their frequency. Lifestyle prevention is extremely important. 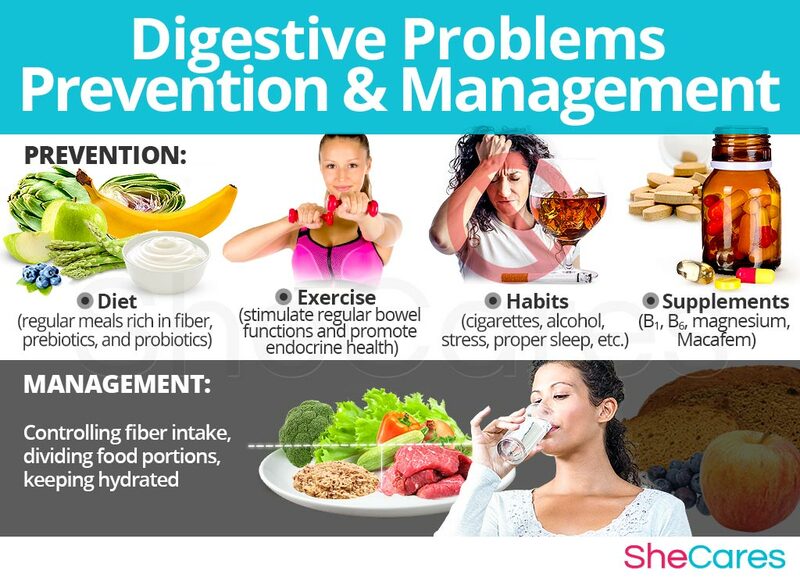 Maintaining a healthy diet, an exercise regimen and healthy habits are all essential in helping to prevent digestive problems and maintain an overall physical and mental health. A woman may seek ways to complement these lifestyle approaches by using supplements that enhance the endocrine system and help prevent or minimize her chances of hormonal imbalance and any related symptoms. For many women who are already experiencing digestive problems, there are many ways to help manage the unsettling symptoms once they have appeared. Keep reading to learn more about the different ways to manage digestive problems. These general tips can be used by women of all ages, and they include hydration, portion control and controlling fiber intake. Furthermore, there are specific management tips for women who experience digestive problems linked to their PMS. Alternative treatments are also a great way to manage digestive problems. These treatments will not tackle the hormonal cause behind most women's complaints, but they are effective in reducing the severity of symptoms on the short and medium term. Alternative treatments include acupuncture and biofeedback. While these measures often help to reduce the frequency or intensity of digestive problems, they are unable to treat their roots, which is most often hormonal imbalance. However, there are several natural treatments that can treat the hormonal cause of digestive problems. Please keep reading to discover approaches to treatments for digestive problems. While some stomach problems may not be able to be healed using only foods and natural remedies, most digestive issues can be at least controlled and managed with a proper diet. Even incurable conditions such as irritable bowel syndrome and Crohn's disease can be treated using the correct diet and foods. In some cases, it may be impossible to prevent digestive problems at some point of a woman's reproductive life. Fortunately, because digestive problems are also a consequence of fluctuations in hormones such as estrogen, testosterone and progesterone, it is possible to treat this imbalance. While there is no magical fix, it is more than possible to find an effective treatment for digestive problems. Three levels of approaches can be considered for treating digestive problems. These are categorized as: (1) Lifestyle changes, (2) Alternative Medicine and (3) Pharmaceutical Options. It is recommended that a woman begins with the least risky option, lifestyle changes, before progressing to the next stage of treatment only if necessary. Pharmaceutical and surgical options should be used only in extreme cases, after properly assessing the risks involved. Read on for further information about these three approaches for treating digestive problems. This primary level of treatment involves the least amount of risk, though conversely it requires the highest amount of self discipline. Simple changes in lifestyle can reap huge benefits in fighting bloating and achieving a higher overall level of health. Fundamentally, an improved diet, regular exercise, and healthy habits can do a woman a great service. While these changes will help alleviate digestive problems, they do not directly address hormonal imbalance - the most common cause of digestive symptoms - so further treatment may be necessary. Alternative medicine has proven to be an excellent way of treating digestive problems related to hormonal imbalance in a safe and natural way. Alternative medicines and supplements involve little to no risk and can be an extremely effective way to treat digestive problems. In the case of herbal supplements, there are two main types that can be used: phytoestrogenic and hormone-regulating herbal supplements. These supplements, such as black cohosh, contain estrogenic components produced by plants that complement the low estrogen hormones in a woman's body, helping alleviate digestive problems. By introducing plant-based estrogens into the body, these herbs treat the underlying estrogen deficiency behind digestive problems. These supplements can be considered the safest and most natural way to treat the underlying hormonal imbalance behind digestive problems, and can be taken throughout a woman's life, as they support the body's natural hormone production. Additionally, there are some other types of supplements that can also alleviate digestive problems, or at least make them more manageable, including vitamins and other herbal supplements. A combination of approaches is usually the most effective route to take. Lifestyle changes combined with alternative medicine will most likely be the best way to alleviate the symptoms of digestive problems. However, for some women the symptoms will be so severe that a more drastic treatment will be necessary. Interventions at the third level involve the highest risk and often the highest costs. 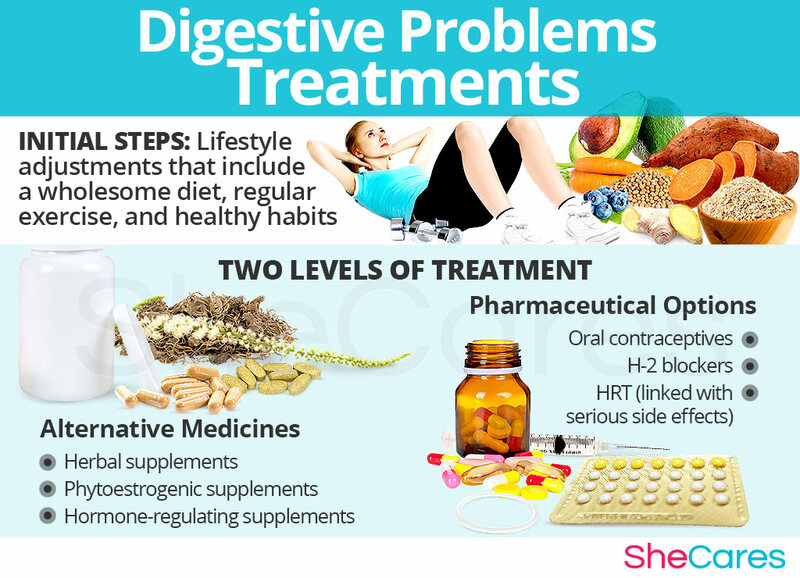 Not all treatments are suitable for women at every life stage, so it is strongly recommended to speak to a licensed healthcare practitioner before starting any pharmaceutical treatments for digestive problems. There are two main types of pharmaceutical options that can be prescribed to treat digestive problems: hormone-regulating medication and H-2 blockers. These three levels of approaches are not mutually exclusive. A woman may use different approaches at different times or any combination of them to treat weight gain, depending on the duration and severity of symptoms. Today more and more women find that dealing with weight gain is best accomplished via a combination of healthy lifestyle choices and alternative treatments. Arthur, C., Ament, M., Song, M. (1992). Prostaglandin metabolism in relation to the bowel habits of women. Prostaglandins, leukotrienes and essential fatty acids. August; 46(4):257-9.